Zippered closure. Elastic brackets hold most 7 inch & 10 inch tablet models including all versions of the iPad including the iPad Air and Galaxy.  The rotating design allows to use in both portrait and landscape modes. The tablet stand also has hook and loop connectors that provides flexible angle options. Zippered closure. Front cover pocket. 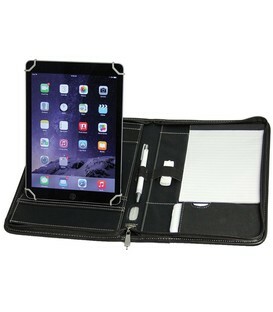 Secure media panel holds all iPad models including the iPad Air, iPad mini, and most other e-readers and tablets. Stylus holder on media panel. 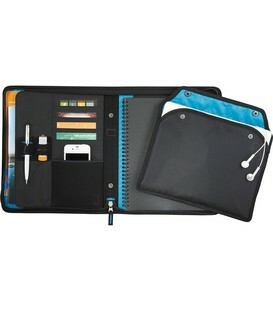 Elleven A5 Compendium - Zippered closure. 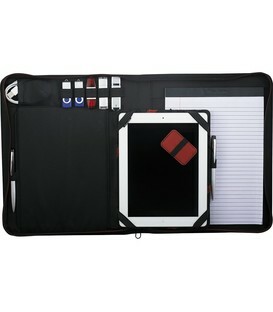 Tech Trap elastic interior organizer. 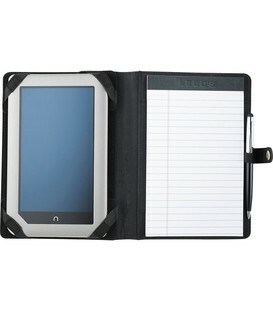 Holds an iPad and also Samsung Galaxy Tablet. Front cover pocket with business card holders. Interior organizational panel includes five business card holders and one USB port. Pen loop. Document folder. 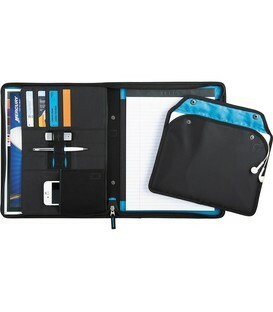 Includes 12.5cm x 20.25cm writing pad. This modern design features a removable Tech Trap organisation unit with easel stand function. 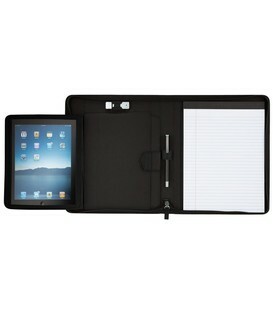 This iPad holder fits neatly into compendiums which have any removable ring system. 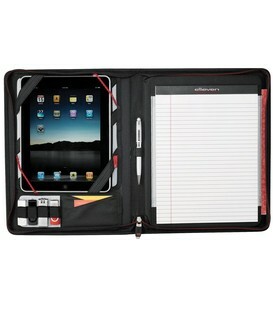 Fits all iPads. 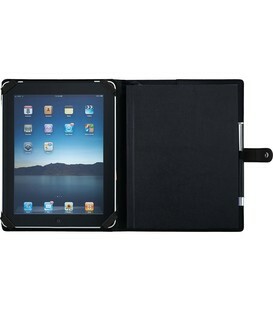 Inside cover features adjustable brackets for holding all iPad models as well as most tablets and e-readers. Zippered closure. 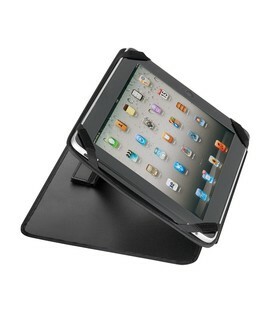 Removable iPad easel stand integrated into interior cover. Adjustable height on easel stand. 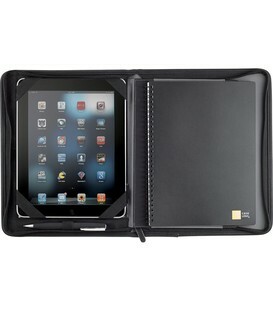 This case fits all iPad models including the new iPad. Includes writing pad. Manufactured in Ultrahyde PU Material. 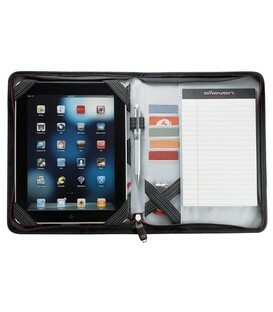 The Zoom Padfolio has all needs covered for any tech-savvy person. Zippered closure. 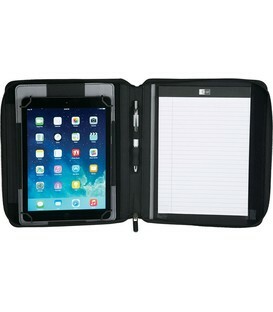 Removable sleeve fits all iPads.